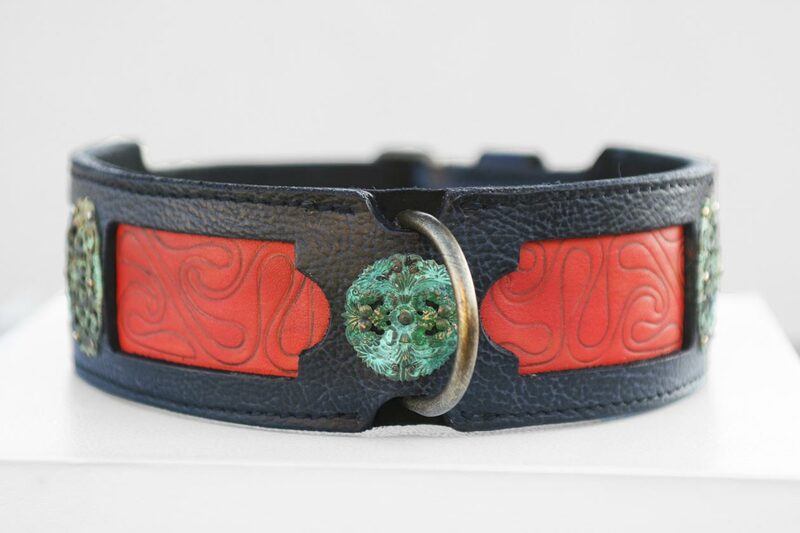 Samartha Black and Red Leather Dog Collar was inspired by the art of Ancient China. Samartha means “plentiful wealth”. 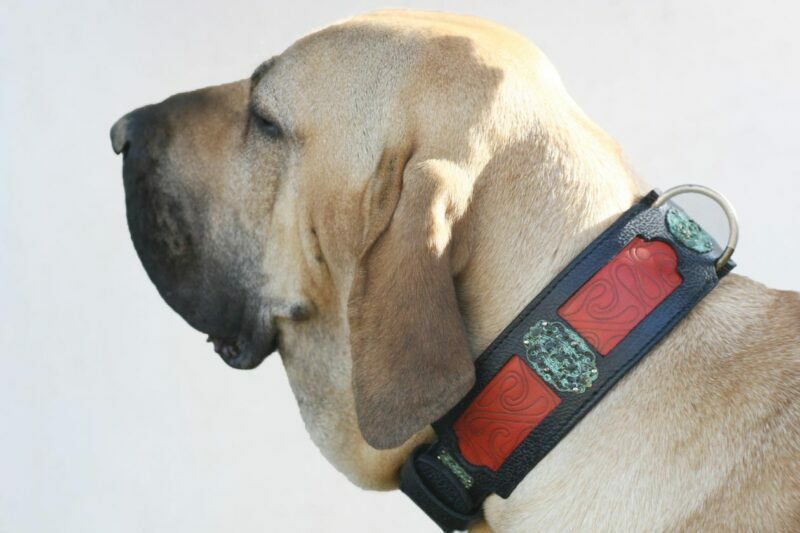 It is a perfect choice for large breed females such as Fila Brasileiro, Cane Corso, Tosa and Dogo Canario but other breeds can easily wear it too. 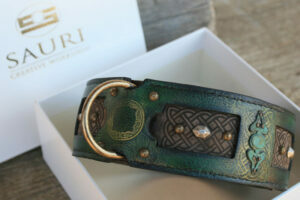 SKU: UC032 Category: Leather Dog Collars Tags: Dog walking, Embossed leather, Fancy leather, Large dog breeds, Medium sized dogs, Ornamented, Uniquely designed Brand: Workshop Sauri | Leather dog collars. 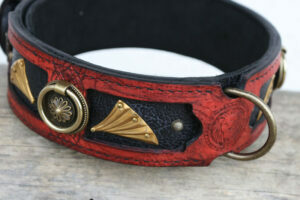 Samartha Black and Red Leather Dog Collar was inspired by the art of Ancient China. Samartha means “plentiful wealth”. 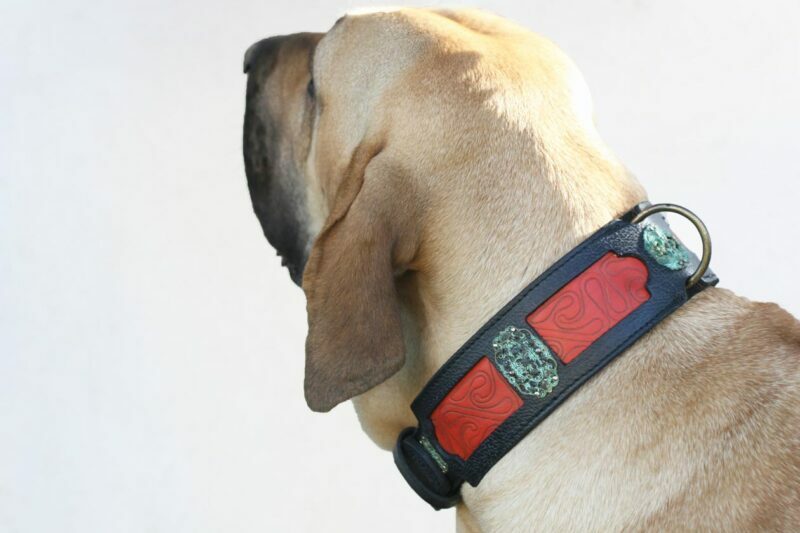 It is a perfect choice for large breed females such as Fila Brasileiro, Cane Corso, Tosa and Dogo Canario but other breeds can easily wear it too. The overlying black leather is firm and decorated with verdigris brass patina filigree stampings. The underlying red leather is with curvilinear embossing. 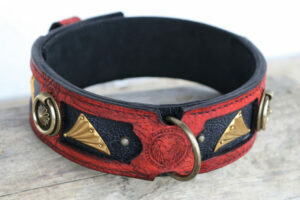 Samartha black and red leather dog collar is hand stitched and machine stitched, durable and resistant to cracking and stretching. 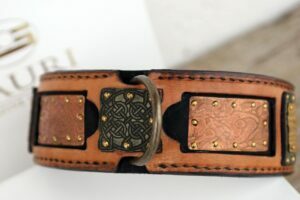 Composed of three leather layers; Where the largest exposure to pressure (buckle, D-ring) – the collar is additionally strengthened allowing you years of day-to-day use. 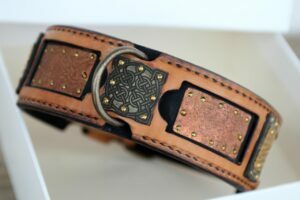 Nubuck background leather is very comfortable for dogs to wear – neck and coat friendly, without riveting on the inner side. 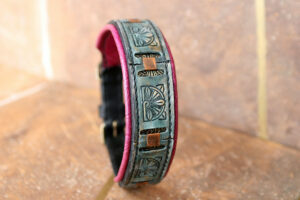 We put nubuck background leather with no riveting on the inner side. 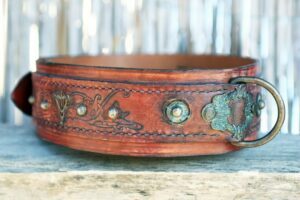 It is hard to hand stitch but the result is really worthwhile: such collar causes zero irritation to the dog. 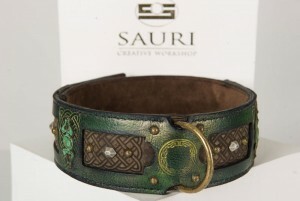 Sauri leather dog collars are compact, firm but not stiff. 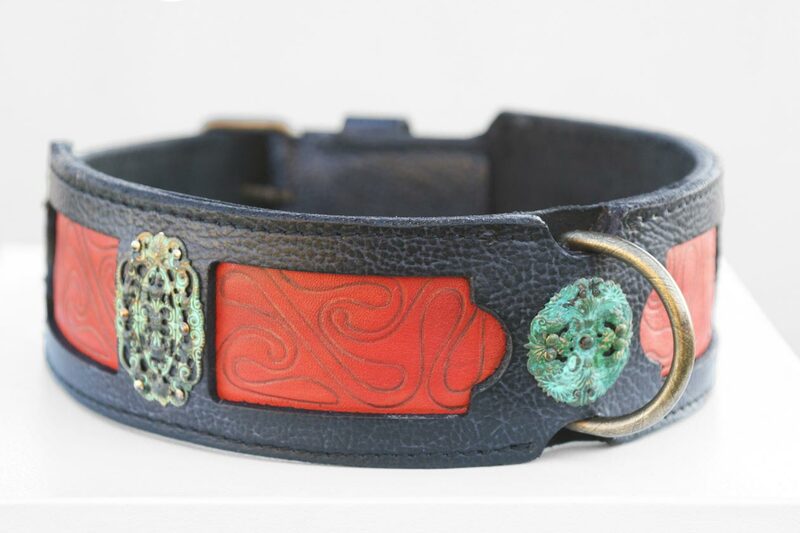 Some models are designed for gentler lady dogs and some dog collars are made exceptionally mighty using full grain harness leather. 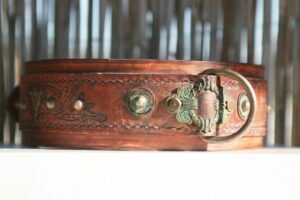 Because of its width the collar sits where it should while the hand stitched leather layers serves as a choke collar – and stops the dog from pulling you too hard.